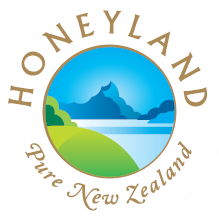 Honeyland (NZ) Ltd was established by Apiarist Sue Walker in July 1986 and quickly secured a notable reputation for high quality, pure, natural, New Zealand honey. From the beginning its mission was to match the superior quality of Honeyland’s products with the same quality of service for its customers. Honeyland originates from New Zealand, an island nation located deep in the South Pacific Ocean. Our treasure lies in our land, with its natural diversity of flora and fauna, created in prehistoric isolation and preserved in a clean and green environment. The unique floral sources of honey available from this environment are presented by Honeyland for you to enjoy. Honeyland was one of the first companies in New Zealand to identify the potential of mono-floral honeys in meeting the increasing demand of customers for food that is healthy and safe, with traceability back to its origin. Honeyland has been promoting the attributes of New Zealand honeys for the past thirty years. In 2001 Honeyland played a key role in organizing a successful two day public seminar in Tokyo in which the late New Zealand scientist, Dr Peter Molan of Waikato University, presented New Zealand Manuka honey research findings to Japanese Honey Industry leaders. Honeyland is a business based on strong ethical values and a keen awareness of ecological and sustainability issues. Honeyland celebrates the fact that the social and environmental impacts of beekeeping are advantageous to our planet, not only to its flora and fauna, but also to its people. By working in close harmony with nature, Honeyland can share the honey from New Zealand’s trees and pasture lands with customers around the world. Honeyland is based in Palmerston North, and works in close partnership with Arataki Honey, Havelock North, from whence the honey is harvested, packed and exported. Welcome to Honeyland – a taste of Pure New Zealand.